The nPower PEG kinetic energy charger makes power for your mobile devices while you're on the go. 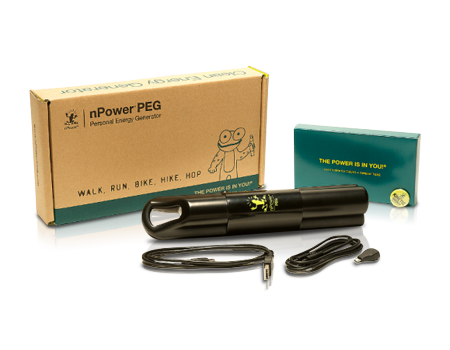 The nPower® PEG is the world’s first mobile device charger that generates CLEAN ENERGY from walking, running, and biking. The nPower PEG gives your phone, MP3 player, e-reader, or other mobile device a charge without being tethered to a wall outlet. Simply keep your PEG in your backpack, briefcase, or purse, and it continuously recharges its internal battery as you go about your daily activities. When your device needs power, plug it into the PEG and press the button. It’s perfect for any adventure, like running through an airport, commuting to work in the city, or trekking through the woods. The nPower PEG provides backup battery power day or night, rain or shine. Long-distance backpackers provide a 20% charge to their smartphones each day from hiking. Commuters in cities like New York and San Francisco extend the use time of their mobile devices twice a week just from walking to and from work and taking public transportation. Fitness fanatics can make their iPod nano® energy-neutral by carrying the PEG while exercising. 90% of the parts used in the nPower PEG are sourced from local suppliers, fueling the local economy while reducing our carbon footprint. Use a damp cloth with water and a mild soap to wipe clean.